I’ve been before but so many bottles of wine ago that I can remember hardly anything about it. Our visitors, Keith and Marlene from Richmond, Va., had never been but it was high on their list of places to see, and quite rightly so. ‘T was advertised as a mainly dry day and it was not a weekend so off we set. Given my recent troubles attempting to use our currently unusable motorways in these parts, and the fact that Windsor is a mere 40 miles distant, off we set across country. Having let rush hour disperse, we were doing quite well until heading down towards Amersham from Wendover. Close to Great Missenden our progress was halted by a stationary queue of traffic the end of which was out of sight. My navigation officer suggested a diversion through Great Missenden and into Beaconsfield via a rather more circuitous, more cross-country route. We were off again and things continued well until, following the signs for Beaconsfield town centre, we ran across a “road closed” sign. It rather looked as though a fair was being set up. Was there a diversion around the obstruction? No! Not a word, nada, rien, nichts! Some traffic was turning right so we followed hoping that they were local enough to know what they were doing. Apparently they did because eventually we came to the A40, the major road running through Beaconsfield. Somewhat relieved, we turned left towards Beaconsfield to get back on course. After about half a mile my jaw fell open as we ran across another “road closed” sign. What?*! Was there a diversion sign? No! Not a word, nada, rien, nichts! I was beginning to spot a pattern. This is the A40 for Darwin’s sake. You surely can’t completely close the A40, a major trunk road between London and Oxford running through the centre of Beaconsfield, without a word about how to circumvent the obstruction? It seems they could. The few vehicles ahead of me began doing U-turns in a handy garage forecourt. I followed suit and tossed the problem back to my navigation officer once again. Eventually, after nearly two hours of being foiled by traffic jams, closed roads and single-track roads with passing places, we arrived at Windsor and managed to park in a long term car park for our visit. 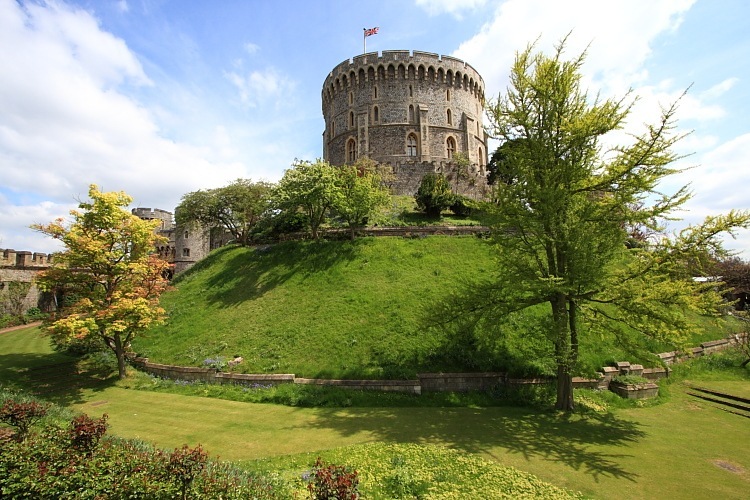 It was a good job we decided to go today and not tomorrow – tomorrow the car park would be closed for the Windsor Castle Royal Tattoo preparations. It had also been nearly two hours of being constantly pounded, jolted and jarred by our now utterly pathetic road surfaces. It is a mark of how green we have become when we are “in residence” – we really do not use the car that much at home these days – that I didn’t know just how universally atrocious our road surfaces now are. Get off the pot-holed (or inexplicably closed) main roads and, in addition to pot-holes, there are frequent over-severe speed bumps with which to contend. We felt battered and drained after a mere 40 miles. It’s a wonder that our vehicles don’t all fall apart. 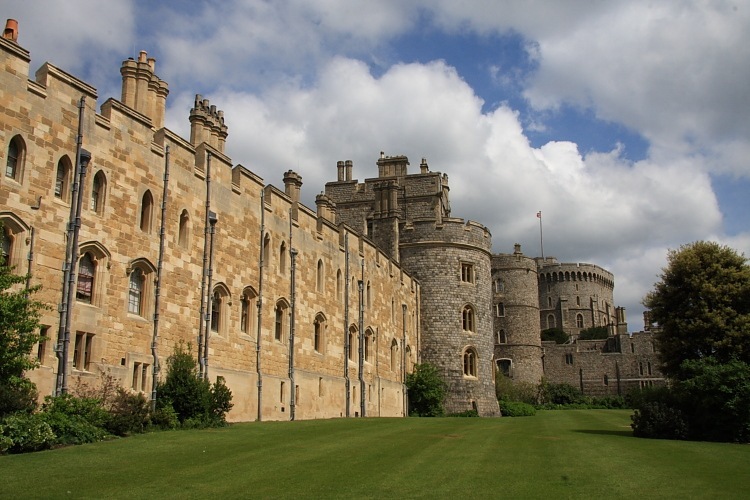 Unfortunately Her Majesty was not "in residence" so our guests didn’t get to see the Royal Standard flying but Windsor Castle was great, especially with the audio tour now included in the £16.00 entrance fee. I couldn’t help but be amused, however, as we paid to see the Queen’s primary residence. In common with many establishments, UK tax payers can Gift Aid their entrance fee. If I understand Gift Aid correctly, this would reclaim from the Queen’s government the tax paid on our entrance fee and gives it back to the Queen. But doesn’t the Queen’s government give a chunk of our taxes, currently £7.9m, to the Queen et al for official public duties in the form of the Civil List? Curious. Don’t get me wrong, I have always been, and remain, a Royalist, it just seemed a strange situation given the money flow. The Crown Estate generates, after all, almost £200m in revenue for the government … or should I be saying lack-of-government given the result of last week’s general election?